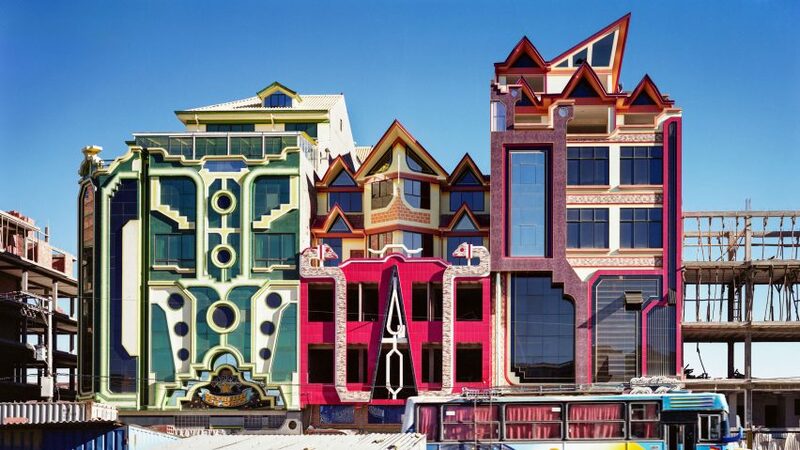 The architect has strived to slowly transform El Alto with his colourful architecture, as seen in these photographs. "In the last 18 years, my practice has been trying to introduce a colour to El Alto," said Mamani, speaking through a translator at The Met's A Year of Architecture in a Day symposium last month. "I have created what I call the New Andean Architecture in El Alto." Located outside of the capital La Paz, about 13,000 feet (4,000 metres) above sea level, El Alto is one of the youngest cities in Bolivia but already its second most populous. The majority of its inhabitants migrated from rural areas. They come from a variety of different Bolivian cultural backgrounds, but around 75 per cent identify as Aymara. Built rapidly over the past three decades to accommodate this influx, the city's urban sprawl is predominantly constructed from traditional adobe mud bricks and similarly hued modern versions. "El Alto is always considered a monochromatic city, because of the altitude and the very cold alpine climate," Mamani said. "[My] buildings, day by day, are giving more of a modernity to the city." His references for the style he has developed come from the ancient city of Tiwanaku, 60 kilometres from El Alto, which thrived 500-1000AD when it controlled much of the Southern Andes. The palace at the UNESCO World Heritage Site is still used for political events and speeches today. "My architecture incorporates lines and motifs from a very ancient architecture, from the imperial capital of Tiwanaku," said Mamani, who visited the archeological site during high school. "I wanted to rescue these lines and motifs from Tiwanaku, and imbue contemporary architecture with these ancient forms." He takes the geometric shapes found among the ruins – which include depictions of condors, pumas and other natural forms – and blends them into more figural organic designs that also reference elements like mountains, lightning, animals and flowers. "All of these elements from Tiwanaku can be translated into symmetrical forms in contemporary architecture," Mamani said. "This architecture has its own language, its own culture, its own identity, and translates these ancient ideas into the contemporary city." For the colours, the architect looks to another local tradition – the woven textiles that are created for, and worn by, women of the Aymara culture. The bright blues, greens, reds and pinks of these fabrics are splashed liberally across the facades of Mamani's buildings. The finished structures each serve multiple purposes. Typically, the first floors accommodate stores and commercial spaces, while the second and third floors are composed of large activity halls for bringing together families and the community. Apartments – or sometimes sports facilities – occupy the fourth and fifth floors, then the top floor is reserved for "cholet": a fusion of the words chola (a woman who wears a very wide skirt) and chalet. The boldly patterned exterior surfaces continue inside the grand halls, where floral motifs form ceiling plates for modern chandeliers and capitals for columns. Mamani has so far completed around 70 buildings like this in El Alto, and more than 100 across Bolivia. Many locals consider these structures to be status symbols. "May architecture serves as a form of trophy, as many of the Aymara people of El Alto want to win or obtain these buildings," Mamani said. "They want to express their culture and identity through these buildings, but they also show economic power in recent years." This has not gone unnoticed by competitors in the construction industry, who have tried to capitalise on Mamani's success by mimicking his signature style across their own structures. "Other contractors and builders in El Alto have followed in my footsteps, and started integrating colour into the facades," Mamani said. "It doesn't bother me that they copy me, I believe that it is really making the city better in general." The New Andean Architecture has also sparked interest internationally, and thanks to widespread media attention, is bringing visitors from around the world to El Alto. "Another benefit is that tourists are now visiting these buildings, and a tourism industry is building up in a city that was previously monochromatic," Mamani said. A recreation of one of Mamani's ballrooms forms part of the Southern Geometries: From Mexico to Patagonia exhibition at Fondation Cartier, 261 Boulevard Raspail, Paris, which runs until 24 February 2019. The Met's In Our Time: A Year of Architecture in a Day symposium took place 19 January 2019, and also included presentations from OMA, MAD, SO-IL and many more. Videos of the symposium's three sessions are available to watch on Dezeen, which was media partner for the event. Photography is by Tatewaki Nio unless stated otherwise.